Since Elder Pavik and Elder Hales were leaving for home at midnight on September 26, Elder Torrie and I got to take them to the Nairobi National Park for a few hours that morning. Fun to be in a park surrounded on three sides by a huge city. The Nairobi Park is the only park in the world that is within city limits. And probably the only park that is right next to an international airport with jets taking off and landing right over the animals' heads. Interesting to watch zebras grazing without seeming to notice the huge jets coming in for a landing. It was good to be with Elder Hales and Elder Pavik for a last hurrah! You will both be missed. Thank you for being such good missionaries! Our mission is shrinking with tall Elder Pavik going home. I always thought Elder Hales (on right) was tall until he stands next to Elder Pavik! We had a good morning with these two fine Elders. The first things we saw in the park were these hippos cooling themselves in the water after a night out filling their bellies with lush green grass. I'm not sure where they found the lush green grass because it's very dry in the park right now. We're in the short rains and they have definitely been short. The long rains in the spring were not long either so the drought conditions are still worrisome. I prayed that we would see lions and shortly after I told Elder Pavik that I had prayed to see lions . . . we saw 9 lions!!! So interesting to see lions in the wild. They look so harmless just sitting there. They probably look harmless because their tummies are full since they hunt at night and mostly sleep in the day. Lots of ostriches and impalas today. A saddle billed stork. Look at those red knobby knees and toes. I like the black markings on these Impalas. An "M" on their behinds and black on their heels. This is prairie land. Actually called "savannah land". Interesting to see palm trees in the midst of prairie land. Cattle egrets feed near the buffalo on insects kicked up by the herds or on insects that are on the buffalo. A close-up of the buffalo and an egret. When I first came to Kenya, I wasn't interested in the buffalo because Len and Bev Ross near Taber raise buffalo for meat so we saw them regularly when we drove from Grassy Lake to Taber. But African Buffalo are definitely different and I find their horns fascinating. One time, LeRon and I were at a watering hole in the Nairobi Park and there were hundreds of buffalo coming to drink. We sat and watched them until one of them put his head down and started pawing the ground. We got out of their very quickly!!!! A buffalo and a little egret. We were excited to see a mama rhino and her baby! From the way this rhino is holding her head, I would guess that it is a black rhino Black rhinos tend to hold their heads upright as they browse on bushes. White rhinos hold their heads close to the ground as they prefer short grasses. But I could be wrong! Mama and baby were running very fast. I was lucky to get this shot through the front window -- I was sitting in the back seat. We haven't seen too many rhinos this close. Pretty exciting! I can't have too many pictures of my lovely zebras! It's interesting how black and white stripes can blend into the environment so well. An eland. Elder Hales and Elder Pavik and I couldn't remember what this lovely antelope was called. But it is an eland, the largest of all antelopes. There are so many kinds of antelopes here and they each have their beauty. Giraffes often stand so still that they look like statues and you often miss noticing them. Giraffes are such regal creatures! I love to watch their loping gait. When our daughter Heather was here, we wondered why so many trees grew in a triangle shape -- until we watched giraffes eating them and then we knew! God must have a huge imagination to have created giraffes and rhinoceroses and warthogs and wildebeests! A flock of vultures!!! 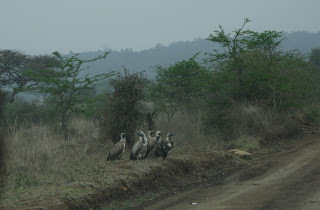 Not sure what they were feeding on but there were vultures on both sides of the road. And they never flew away when we stopped to watch them. I'm pretty sure these are white-backed vultures. I never thought vultures could be so interesting but actually . . . they were! A guide at the Ngorongoro Crater told us that you pronounce Wildebeest with a long "i" not a short "i" like most people say. He said that they are definitely wild. I've always thought wildebeests were ugly creatures but they are actually quite interesting with their black stripes, their floppy light beards and the hair covering their eyes. I thought this sign was funny: "Be observant and patient for a better cameras result". Cute! I didn't know rhinos moved so quickly.